There is something so peaceful and calming about lying at the beach, listening to the waves. Oh how I miss summer vacation and my life sans responsibilities! Although we can all agree that a beach vacation would be the ideal place to stress less, you can bring that feeling of care-free(dom) to life wherever you are by engaging your senses. We take our senses for granted from day to day because we get wrapped up in multi-tasking and sensory overload, but your senses can be stress-busting saviors when you spend the time to individually focus on them. There is a reason we love the spa. The sanctuary feeds all of our senses in one short visit effectively reducing our stress levels. 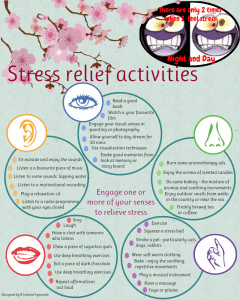 What type of sense is the best form of stress relief for you? Sights: Being a visual person, visual-based activities tend to be soothing and uplifting as they bring my mind to another place. Close your eyes and breath! Sounds: Are you an auditory person? Do you love music? If so, experiment with sounds to reduce stress and exercise your acoustic muscles. Smells: There is something about a burning lavender candle that instantly puts me in the calm zone. Surround yourself with energizing and soothing scents to comfort you when you are frazzled. Touch: If you are a hugger you know how beneficial the power of touch is. Experiment with tangible sensation and focus on those that relax and renew. Taste: Mindfully indulge your sense of taste. Slowly savoring a favorite treat can help focus your stress elsewhere. Just remember the key is to pamper your tongue in moderation so that your stress doesn’t impact your waistline. Reduce stress with your senses! Experiment with some of these sense enhancing activities. Don’t allow stressful moments to overwhelm you and take over! Put your senses to work to help reduce and melt away stress. What stress-busting sensory experience do you want to try? Which sense are you most in tune to? Share your quick stress relief tricks! Medhya Rasayan traditionally been used in all age groups to enhance all aspects of mental performance, including intelligence, concentration, awareness, perception & learning capacity. It supports healthy cerebral function. It improves concentration & attention span. Nourishes & rejuvenates the mind. Medhya Rasayan is widely claimed as restorative, nervine and mental tonic. It have got prominent action on Central Nervous System where it improve grasping power, memory, intellect, speech and correct aberrations of emotions, mood and personality of an individual It is indicated in the treatment of loss of memory and associated mental disorders like insanity and epilepsy. It is highly beneficial in insomnia, neuritis, anxiety & depression.